Well, I failed to get to number one in the Bond songs, pretty spectacularly at that. I’m now in Kansas at the James Gunn Center for the Study of Science Fiction, with seven other workshoppers and Kij Johnson and Barbara Webb at Kij’s novel workshop. It’s been very instructive after only one day, and today we jump into actually workshopping people’s novels. I go Thursday and am already rethinking my novel outline, although I haven’t yet gotten to the point of rewriting it. Kansas is beautiful, also hot and humid. The people here are lovely and I am having a blast talking about writing. More Bond flash fics when I get back in a couple weeks. The Clarion Writers Workshop changed my life and my career. For six weeks I lived on the UCSD campus in La Jolla, interacting mostly with the seventeen other students there and the six wonderful professional writers who’d come in to lead our workshops (and the support staff of Clarion, who are amazing). We read about a hundred of each other’s stories in six weeks and had to come up with something smart-sounding to say about each one. We each wrote (more or less) six stories in six weeks. And we talked more about writing, about the craft of it and the ideas behind it, about the direction of science fiction and fantasy, about the current trends and the history, than probably I have at any other time in my life. There is something magical about being immersed in a world full of people like you and yet not like you. Every one of my classmates is a talented writer who wants more than anything to tell his or her stories to the world, and yet the things we want to tell stories about are often vastly different. Some of us love literary fiction, some of us love horror, some of us love action and adventure, some fantasy, some science fiction. But those classmates are still close to me, a support network for writing that has been really amazing over the past couple years. We’re going through many of the same struggles, and sharing our disappointments is often more helpful than sharing our triumphs (though it is awesome every time I get a “New sale!” letter, and our class is generating a lot of those–go Narwolves!). And Clarion gave me the tools and confidence to send my stories out there myself. I had a story published in Apex last year and have a few more out on the market now. I’d sent out maybe a total of three or four stories to magazines, and gotten rejected, and given up. I understand a lot better now that rejections happen to everyone, a lot, and the type of rejection can tell you a lot–there is such a thing as a good rejection. 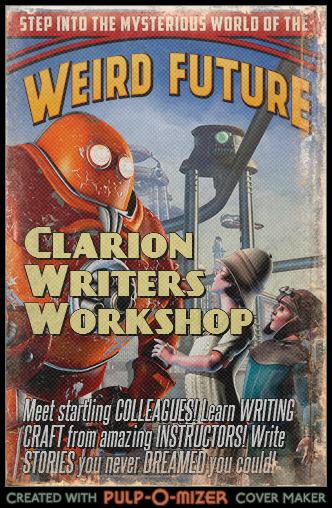 So if writing is what you want to do with your life, apply to Clarion. Those six weeks are one of the best investments you can make. I’m a bit late on this–like a month–but the Clarion Writers Workshop was one of the best experiences of my writing career (up there with first published novel), and they are accepting applications for the 2012 class. What you get: six weeks with people you already know are amazing (check out the lineup of instructors!) and people you will discover are amazing (your Clarion classmates will always be part of your writing life); hopefully renewed confidence in having your work taken seriously by your peers and instructors; unparalleled insight into what makes a good story, both from the instructor lectures and from reading and working to critique over a hundred stories written by your peers. Plus you get to live near the San Diego beach for a month and a half. There is also Clarion West, which has its own impressive lineup of instructors and takes place in lovely Seattle. All the things I hear from it are positive. If you are serious about your writing and think you are close to being publishable, you owe it to yourself to at least apply to one of the above. One of the benefits of participating in so many workshops has been getting practice at critiquing. I’ve always been good at criticizing others, but not necessarily in a way that they can take as positive. So it’s good to practice shaping your criticisms in a way that will not be taken as “you stink” and will also give the recipient a direction in which to focus his or her editing. I also had to write critiques for the latest round of New Fables rejections, and those were pretty hard, because in some cases the stories were pretty good, just not what I was looking for. So I had to explain what I was looking for and then point out that the author might not want to change the story in that direction. But that’s their choice; it’s my magazine and I have a pretty clear idea of what kind of story I want for it, even if it is occasionally frustratingly difficult to communicate that to others. Anyway, in at least two or three of the cases, the author responded and indicated that the feedback was helpful, so I feel good about taking the time to do that. Yet another reason to go out and join a workshop, if you’re not in one now! Practice critiquing; it makes you a better writer as well as a better reader. I’m taking another Stanford Continuing Studies workshop this term. This one is “Fiction For Experienced Writers,” which is pretty much exactly what it sounds like. I’m pretty excited, as it’s been over a year since my last fiction workshop (the wonderful “Fabulist Fiction” class). In the meantime, of course, I’ve been working with our New Fables group, so I haven’t been lacking in workshoppy goodness, but it’s always nice to be exposed to a new group of writers. We’ll see how the fabulist/spec fic stuff goes over with this group. By the way, if you’re not in the area or can’t spend the money/time to take a class on campus, you can download some classes from Stanford (and other universities) on iTunes U. I’ve very much enjoyed the lectures I’ve gotten from there–my favorites are the “why people do evil things” and the series on Benjamin Franklin (who might be in the running to be my new role model). I’ll keep updating as the class goes on. Meanwhile, I can’t overstate the value of workshops in general to help develop both your writing and critiquing skills. Being part of a writerly community is a great way to spark your writing, and learning how to critique other people’s work helps you think more critically about your own. So needless to say, I’m looking forward to it. Some friends of mine are taking Carl Yorke’s “Writing For The Movies” class, which examines movie structure and is a terrific class even for novelists. Movies follow a pretty standard structure which is also a good one to keep in mind as a basic story structure for your prose. Carl knows his storytelling inside and out, and is not just a good teacher, he’s a great guy besides (though he’ll deny that). If you’re interested in movies at all, or in story structure, I can’t recommend his classes highly enough. Anyone else taking another Stanford CS class this winter? Anyone else taking one of the two above? I’m at a convention right now, in chilly Chicago. One of the best things about these conventions is how inspiring they are. I always come home bursting with ideas and plans. Of course, very few of those ever get done, but there are a couple stories (“Common and Precious” among them) that got kick-started by discussions at these conventions. Our travels took us to Minneapolis to visit friends, coincidentally at around the time Kelly McCullough, of the excellent Wyrdsmiths blog, was doing a reading and signing at Dreamhaven Books and Comics. We made a trip down there and arrived just in time to hear Kelly read from his latest book (which is due out this summer), the third in the “Webmage” series. We enjoyed the reading a lot. Kelly’s writing is snappy and fun, with a good sense of humor, and his world is a complex and entertaining one–sort of like Tim Powers meets Douglas Adams, if you can imagine that. I picked up both his books and will be reviewing them in this space as soon as I work through some of the rest of my stack. I wanted to talk more about the community of writers and how important it is. Several of the people at the reading were clearly friends of Kelly and familiar with his work, and though I didn’t confirm this, I suspect many of them were other Wyrdsmiths writers. The same was true at my book signing, and I think from what I’ve been reading of signings that it’s not uncommon across the board, unless your first initials happen to be “J.K.” and your last name “Rowling.” And I think that speaks to the importance of having other writers in your circle, not just so that they can critique your work, but so that you have someone to commiserate with and celebrate with, someone to go to your book signings and someone whose book signings you can attend. Writing is a solitary act by its nature, but appreciating writing can be very communal, and in fact, that’s how many books gain popularity. The “Divine Secrets of the Ya-Ya Sisterhood” phenomenon took off because women in local book clubs were falling in love with the book and discussing it, not because it was promoted by the publisher–but that’s another story. The moral is, if you’re a writer, go find other writers. This is one of those cases where I think online-only communities don’t substitute for real life. Our New Fables workshop meets bi-weekly, and we only take new members who are local and enthusiastic enough to show up for most of the meetings. That community has been a big help. The best part of taking classes at Stanford was learning how workshops work so Kevin and I could put that workshop together, and meeting other people who shared an interest in writing to keep in touch with. Who helps you write? How did you find your communities? Or do you not have one and need one?